Last year I was assigned to read a book on creative writing. 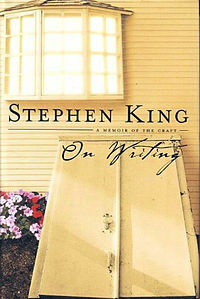 I wound up choosing Stephen King’s On Writing: A Memoir of the Craft; a cheeky, bright, and inspiration text by one of the most successful authors in the business. For me, staring at the blank page of a notebook or the blinking little mouse button on the empty Word screen of my laptop can be the most intimidating part of the writing process. I can have an entire novel mapped out in my head one minute, then sit down to write the next and completely lose everything. You sit there, staring at blank nothingness, wondering where the words are and why they’re evading you. You start to feel like Spongebob in that episode where he’s trying to write an essay about what not to do at stoplights. What works the best in this situation, and King will tell you this himself, is that you just have to go. Write whatever comes out even if it sounds ridiculous and horrible. You can always go back and fix it later. What matters is getting the words on the paper/computer. Honest to God, do you know how many times I’ve made this excuse to myself? “I’m just not feeling inspired today!” Mr. King says that is no excuse! Writing, like anything in the world, is sometimes quite like that job you had in high school that you hated going to but desperately needed. You have to do it every day if you want to get anything out of it. Waiting until you feel “inspired” to write will get you nowhere except feeling really pretentious while you sit in Starbucks and tell your friends you’re a “writer”. Writing can feel like a chore sometimes, but in the long run, it can feel oh-so good! So just get up and do it! You will hear writers say this again and again. Adjectives and adverbs are your enemies and you should avoid them at all costs. For those of you who have ever read a Stephen King novel (or any of his other works) may have never put much though into this concept but I dare you to go back into your copy of The Shining and circle every adjective or adverb in the book. 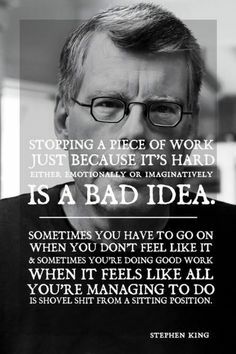 You won’t find very many, because Stephen King doesn’t let them drag him down to hell. There may be a lot in his first draft but by the finished copy he has taken them all down with his mighty editing eye. His writing is substantial and rich without the use of adverbs or adjectives and yours can be too. u. King addresses this problem as simply and head-on. You’re not limited to a topic when it comes to creativity and imagination. Don’t over-think it and just write it, okay? King is channeling Mark Twain here when he says “write what you know”, and sometimes what you know is going to offend people or it’s going to be so bluntly honest it’s going to make a lot of people angry. Sometimes you sit there and you’re writing and you write something so scandalous you think “I wouldn’t want my mother reading this and especially not knowing I wrote it!” but there are a lot of things out there in this big scary world you mother probably doesn’t want to know that you know. Don’t compromise your writing for the sake of attempting to make everybody happy (even your mother). If every great writer abstained from the scary topics all our greatest novels would be about woodland creatures and making friends. You’re going to write and people aren’t going to like what you have to say. Who cares? One of the more profound quotes in the book, this one needs very little explaining. To a lot of writers, the act of writing allows them to address things that they normally would avoid thinking about altogether. Writing can connect a person with the most tragic stories of their past as well as the happiest memories they have. Writing is the key to all of life’s joys and woes. I cannot stress enough how important reading is when you want to be a writer. Read all the time. Even if it’s just that ridiculous BuzzFeed article you saw on Facebook. Read it. Read the greatest works of fiction and poetry known to man, or just read some trashy 50 Shades of Grey type non-sense that you picked up on the sale rack of Walmart if that’s what you like. If you want to write the next Harry Potter or the next Great Gatsby you have to read them first. Having someone who believes in you can make all the difference in the world. Support can come in many forms. You may want to see out a writing group, sharing a short story with your parents, or even just bouncing an ideas off a friend can really give you a more positive outlook on your writing and help make you a better writer. Writing has helped me through the toughest of times and allowed me to channel my emotions, both positive and negative, into something beautiful. Write for whatever your reasons are. I write to get happy, how about you? I wonderful piece. Many interesting points of view.